Lavender comes form the Roman word 'Lavare' meaning to wash. It was one of the most favored aromatics used by the Romans in their bathing rituals. Both the Greeks and the Romans burned Lavender twigs as a room purifier to ward off the plague. It was brought to Europe by the Romans. A shrubby plant with woody branches and long narrow leaves it has purple blue flowers on long spikes. After cutting the plants are dried and steam distilled. 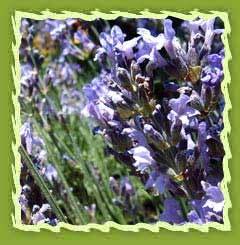 Lavender oil has fresh, sweet, floral, herbaceous and slightly fruity. Lavender oil has various chemical compounds that include flavonoids, nerol, coumarins, linalool, linyalyl acetate, cineole, Tannis, borneol. Extraction: Steam distillation of the flowering parts. A lavender oil soothes nervous exhaustion. It is mostly used for inhalation, bath , room spray and massage. It is used as a cold compress or place a few drops in boiling water and inhale for headaches and migraine. It improves sleep quality, promotes relaxation and lifts mood in people suffering from sleep disorders. Lavender oil helps speed up the body's natural healing and reduce pain and scarring. Oil is included in lotions and it is used in massage oils to help relax muscles. Few drops of lavender oil is added to water (mineral) and spray onto sunburned skin. Enjoy a relaxing bath and relieve stress by adding lavender oil to the bath. For temporary relief of stress, nervous tension, migraine headache and insomnia sprinkle a few drops of lavender oil on the pillow for restful sleep or add to bath water for a relaxing bath. Apply for relief of blue bottle stings, tick, wasp and insect bites. Mix 50% with water and apply as a lotion or use in a spray bottle for soothing relief to sunburn. For the most versatile household use of this product - mix with water and use in a spray bottle for room freshening. Add a few drops to the laundry rinse water or lightly spray into the dryer to add a fresh, clean smell. Add to water when mopping floors. Cleaning compositions contain a bleach-stable water dispersible or water-soluble yellow colorant and either a chlorine bleach or an oxygen bleach. The compositions may take the form of automatic dish washing detergents, in granular or liquid form, and preferably also have a lemon-like scent to compliment the yellow color.